Of Cats and Men author Sam Kalda profiles some of history's great cat-loving writers. Men are often portrayed in the company of dogs. They hunt together, run happily side by side, and ride shoulder to shoulder in mud-splattered pickups—the perfect image of masculine bliss. The dog is, after all, man’s best friend. Some men, that is. For centuries, legions of forward-thinking men—artists, writers, scientists, and philosophers––have shared their libraries and studios with a purring feline or two. In recent years, a new population of proud, cat-loving men has come out of the proverbial “cat closet,” embracing the purr, mew, and squint of feline companionship. 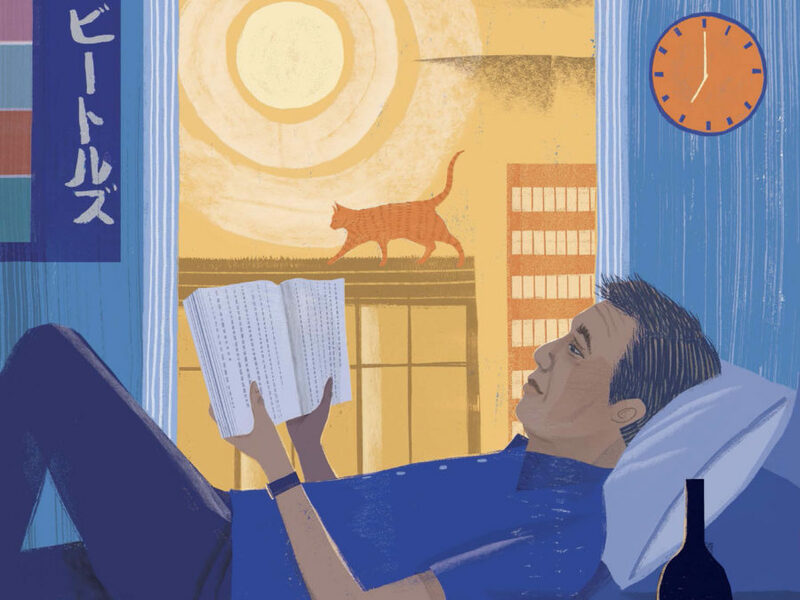 In his new book, Of Cats and Men, author and illustrator Sam Kalda depicts some of those feline-friendly men, offering insight into their lives and their pets. He shared with Read it Forward a few classic authors who were also cat lovers! If this collection of cat men were organized like a high school yearbook, American writer Mark Twain (né Samuel Clemens) would easily win “Most Quoted” in the list of superlatives—and probably “Best Mustache,” too. Twain is one of the great wits of the nineteenth century, in an age noted for its great wit. Called “the father of American literature” by William Faulkner, Twain wrote novels that remain perennial classics. In the canon of Twain quotations, there is a sizable cache of quips about cats. A consummate ailurophile, Twain at one point kept as many as eleven cats on his farm in Connecticut. Some of his fabulous beasts’ names include Sour Mash, Apollinaris, Zoroaster, Blatherskite, and Beelzebub. In one story, Twain was watching his daughter’s cat while she was away convalescing in a sanatorium—as one did in 1905. 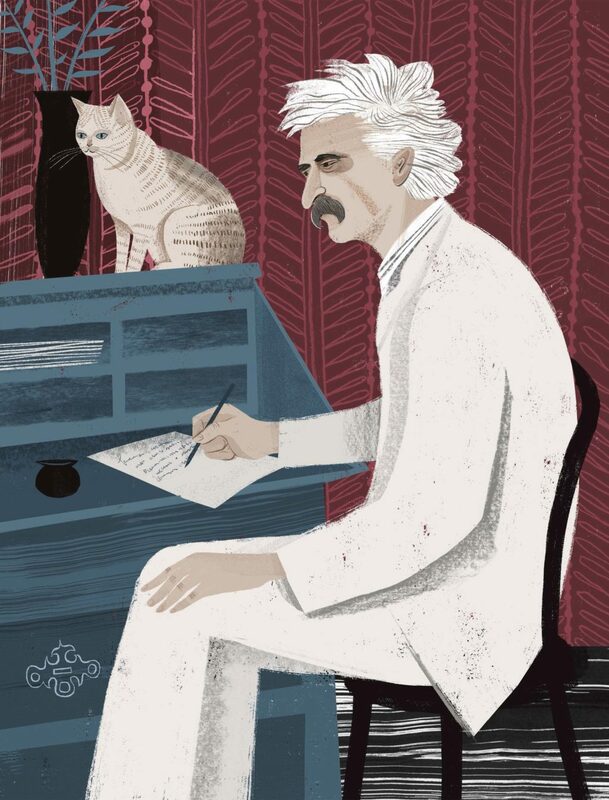 This distinguished-looking black cat quickly became a favorite of Twain’s. Bambino, as he was called, was living with Twain in New York when he disappeared one day. After initial searches turned up nothing, Twain took out an ad in the New York American newspaper, offering a reward for his safe return. Ernest Hemingway is popularly depicted as the archetypal macho writer. While he certainly embodied the most flamboyant features of masculinity—guns, booze, women, and big game hunting—Hemingway had a much softer side. Entombed within his great barrel chest was a cat man of epic proportions. A member of the so-called Lost Generation (a term coined by writer Gertrude Stein), Hemingway moved to Paris as a journalist after World War I and joined a circle of literary expatriates, including Stein, F. Scott Fitzgerald, and James Joyce. Despite his connection to the urbane literati of Paris, Hemingway is most often associated with rugged adventure. His love of hunting, fishing, and bullfighting led him around the world, eventually owning homes in Key West, Florida, as well as Wyoming and Cuba. While living in Key West, Hemingway was given a cat by a ship’s captain. Snow White was a six-toed feline, the first of Hemingway’s famous brood of polydactyl cats in Key West. Polydactyls are born with extra fingers and toes. For a human, this can be the addition of a digit or two. For cats, however, the math is much more impressive. The world record for extra cat toes belongs to Tiger, a twenty-seven-toed marvel. As Papa Ernest not so famously said, “One cat just leads to another.” In the case of our feline comrades, eighteen toes just lead to another nine. 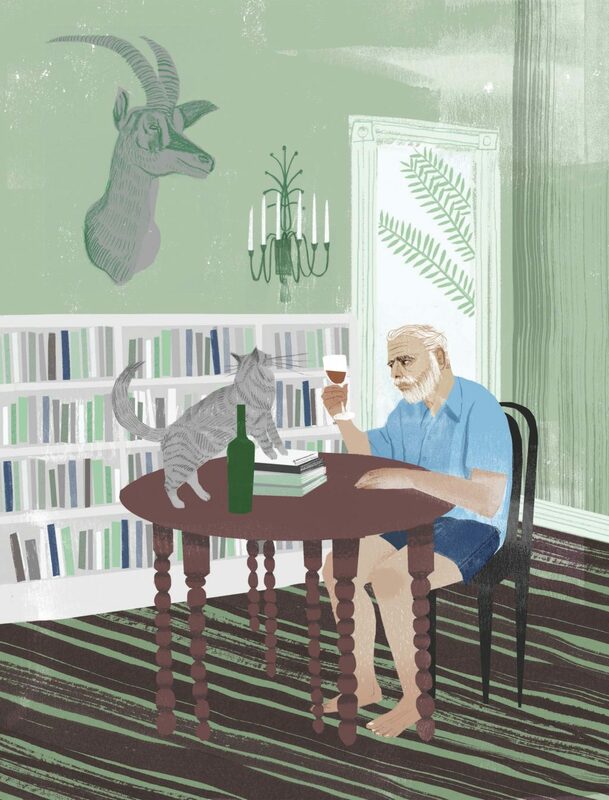 Hemingway’s cats—or “purr factories” and “love sponges,” as he was fond of calling them—reveal a softer, more nuanced portrait of Papa. In a gentleman’s club such as this, there are bound to be a few scandals. When Beat Generation writer William S. Burroughs’s novel Naked Lunch was published in 1962, it was the subject of what would be one of the last major obscenity trials for a work of literature in the United States. His gritty, drug-addled prose touched a nerve, revealing the paranoid shadow-self of booming postwar America. He was a revolutionary writer, gun enthusiast, junkie, and gay grandfather of the counterculture. However, amid the din of his much-discussed law-breaking exploits, there was a separate narrative playing out: the quiet story of Burroughs the cat man. 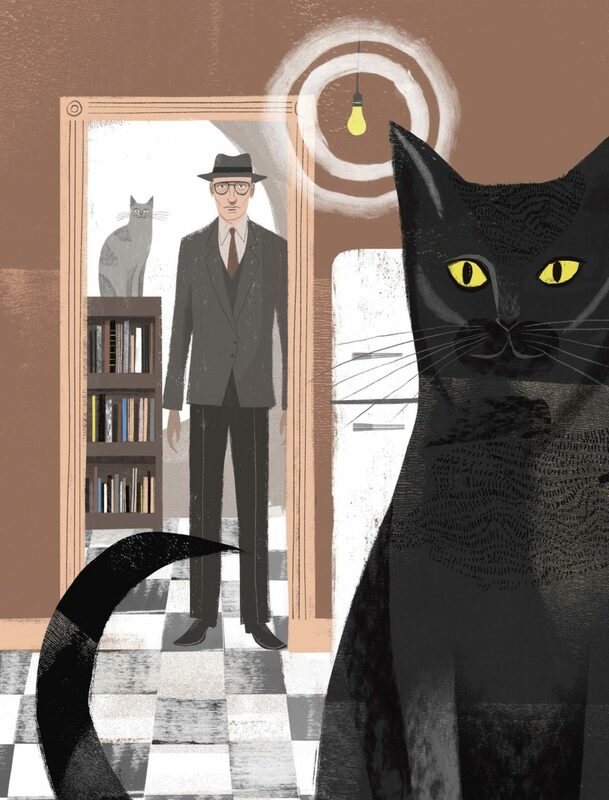 In many ways, Burroughs connected with cats more than people. His house in Lawrence, Kansas, was a virtual cat colony. For the Harvard-educated writer, cats were not only much-loved companions; they were also spiritual guides. Fletch, Ruski, and Smoke were a few of Burroughs’s beloved familiars that tiptoed through his life like a poetic motif. A missing cat is a terrible thing, dear reader. And an unexpected journey into the underworld isn’t much more desirable. 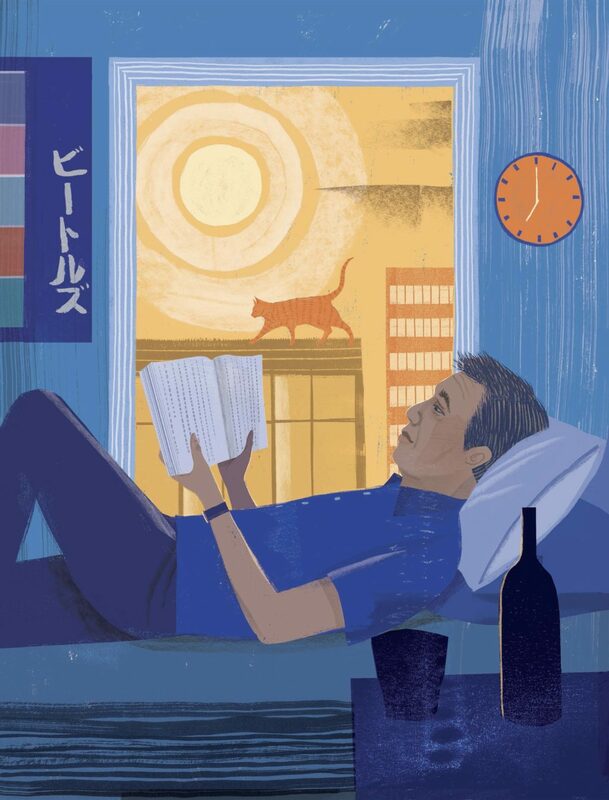 However, for superstar Japanese novelist Haruki Murakami, either scenario is an occasion for a metaphysical reading experience. Murakami’s stories lead the reader to the bottoms of wells, isolated libraries, and interdimensional hotels. Men can talk to cats and cats respond in kind. For being one of the most internationally renowned novelists of his generation, Murakami the man is mysterious. He began writing at the age of forty. Prior to that, he owned a jazz club and coffeehouse in Tokyo, aptly named the Peter Cat. Notoriously reclusive, Murakami has composed many of his beloved novels in the company of his feline familiars—Kirin, Butch, Sundance, Mackerel, and Scotty, to name a few. In his novel Kafka on the Shore, one of the protagonists is a character named Nakata, who, after suffering total amnesia as a child as the result of an extraterrestrial experience, has the ability to speak to cats. In another story called “Town of Cats,” from his weighty novel 1Q84, a man finds himself marooned overnight in a town populated with cats. The man hides in a bell tower and witnesses the large cats’ nocturnal lives: going to work in their offices, shopping at the pharmacy, and drinking in bars. 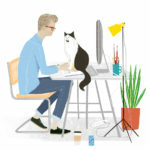 Download these illustrations as posters so you can show your feline love! Excerpted with permission from Of Cats and Men: Profiles of History’s Great Cat-Loving Artists, Writers, Thinkers, and Statesmen © 2017 by Sam Kalda. Published by Ten Speed Press, an imprint of Penguin Random House LLC.